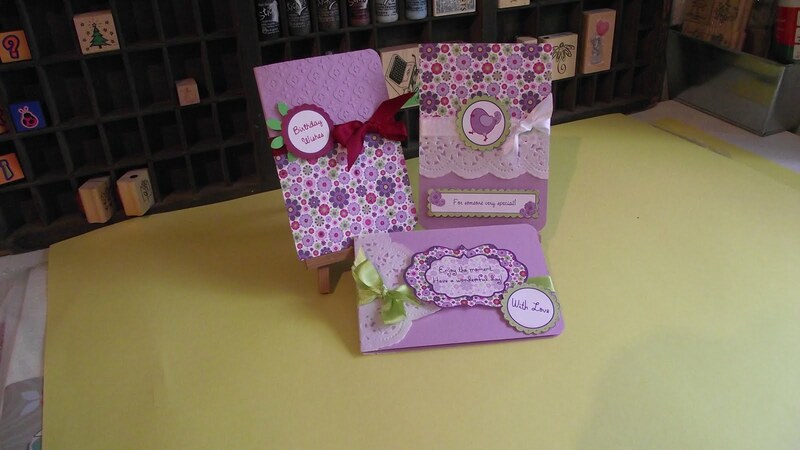 Here are three cards I made using some of the 16 craft papers free with Making Cards magazine. By matching the lilac floral print with some lilac cardstock, different coloured ribbon and a paper doilly, I managed to make three different cards from the same sheet. Finished off with a few of the coordinating embellishments and sentiments that come with the paper, not a bad haul from one A4 piece of paper I'd say! Next I intend to have a go at the remaining papers which have school and travel themes. Hope you like todays post and thanks for stopping by.